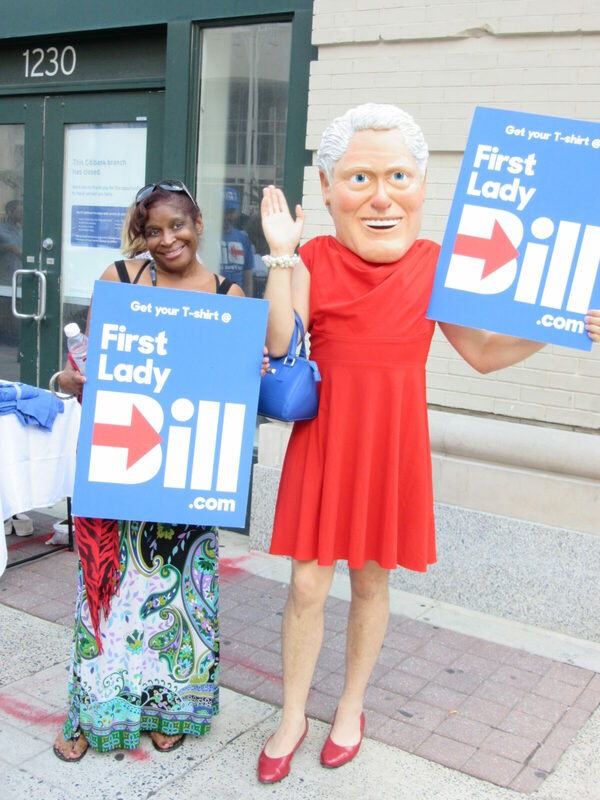 The Democratic Party holding its big convention in Philly? Fugetaboudit. As a Philadelphian born and bred (well, I was actually born in the Main Line ‘burbs, but…close enough), I got a lot of pleasure watching people practicing the art of politics. It seemed the whole city took a four-day seminar on political science. It was right in my wheelhouse. I even got a gig driving around party delegates, leaders and elected officials. At least it got me inside the steel fencing surrounding Wells Fargo Center, the convention site. 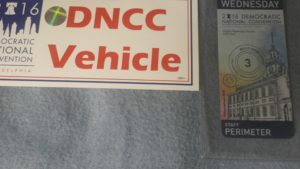 I had to pass a Secret Service background check for motorpool access, and how I passed that, God only knows. The perimeter around the Wells Fargo Center was like a fortress. Most Philadelphians weren’t so interested in getting “credentialed,” so they swarmed Center City to check things out. The typical Philadelphian is a loyal Democrat who doesn’t think a lot about politics until a local elected official is jailed for corruption, which occurs about every year or so. Hopefully, a political convention with a positive message and free souvenirs could have a cleansing effect on the local populace. It seems on every street corner, there were people with colorful takes on some political ax to grind. Some of them weren’t even about Bernie Sanders. 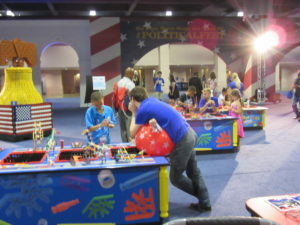 At the Pennsylvania Convention Center located in the middle of town, folks could experience PoliticalFest, a supposed non-partisan celebration of our political history, with displays running the gamut of presidential profiles, the Air Force One fuselage and a replica of the Oval Office. For Philadelphia and visiting families, there were lots of displays for kids in an area called Future Leaders Zone. Bars and restaurants around town had their game faces on for the visiting hordes. 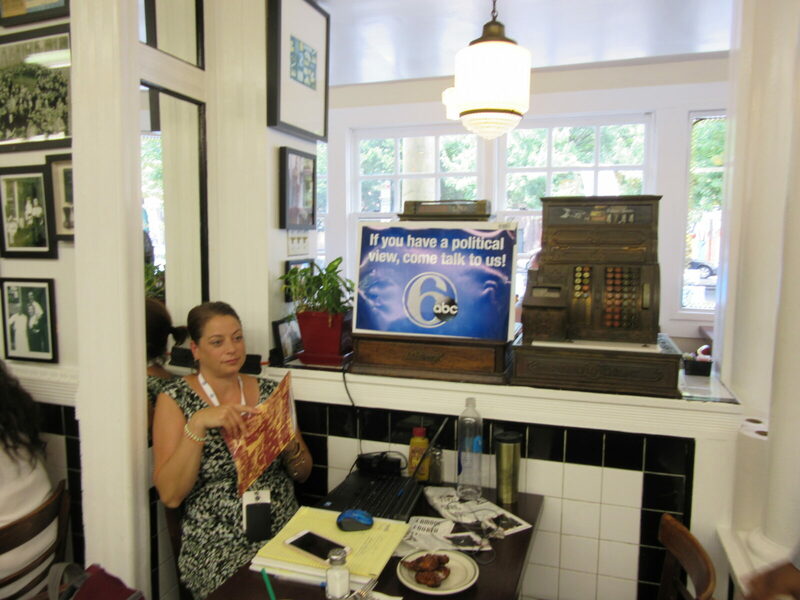 One of my favorite lunch spots, the Famous 4th Street Deli in Society Hill, continued an election day tradition by setting up a “speakers’ corner” of sorts in the middle of its restaurant on each day of the Democratic convention. 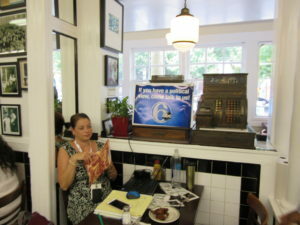 WPVI-TV, Channel 6, set up shop. 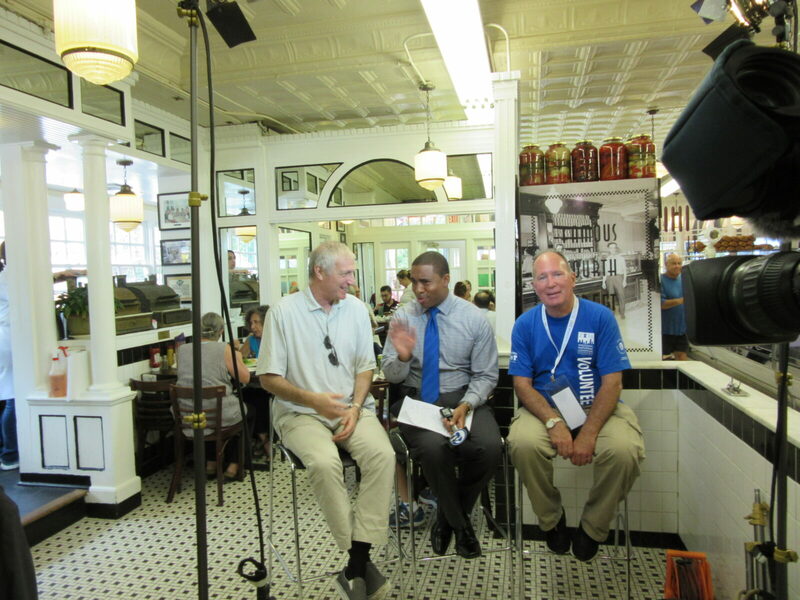 The local ABC affiliate filmed the more livelier political debates for its 5:00 news program. When I stopped by for lunch on the convention’s first day, I agreed to take up Hillary’s mantle against a Bernie supporter. That’s me on your right in a convention t-shirt. Temperatures hit the mid- to upper-90s for the duration of the convention. This was not a time to be outside. 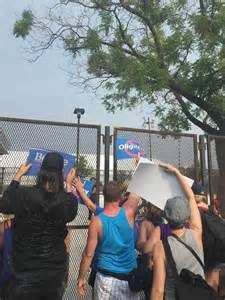 The cops had their hands full with Bernie Sanders protesters, who were a constant presence outside of the fencing that separated credentialed convention workers from the populace. 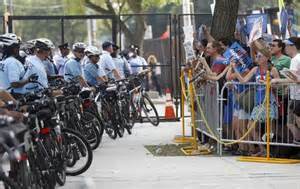 I remember being constantly yelled by protesters at as I walked inside the fence from the subway to the motor pool during the first two days of the convention. But after Bernie released his delegates on Tuesday night, there was not a peep from them when I got to work Wednesday morning. It was like they disappeared into thin (hot) air. It calmed down considerably by Wednesday. I suppose it was the heat that made the police to be a bit jumpy even to convention workers moving to and from the site (one very depleted officer yelled at me to slide my monthly subway pass through a particular slot…not a necessary command for this life-long subway rider). But our cops were fine. 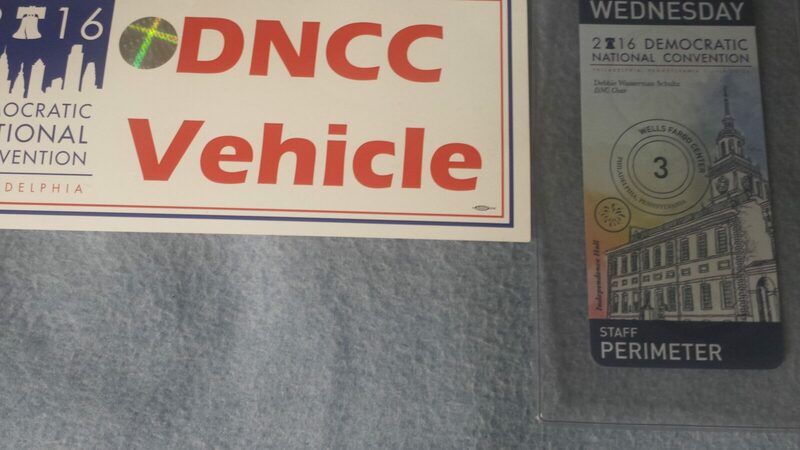 It was the Democratic National Committee (DNC) who took security precautions to a bizarre level. Our credentials told us exactly where we were allowed, but more importantly, not allowed to go inside the steel gates. There were layers of credentials that were baffling to most of us: podium, floor, arena, hall-light, hall-dark, perimeter, suite overlay, backstage…a labyrinth of paranoia. The press, all 15,000 of them, probably had it the worst. Most reporters were jammed into a “Hooverville” (thanks to Marketwatch) of media tents that were set up in the parking lots surrounding the arena. Half of them never made it inside the arena, but rather “covered” the convention by watching a big-screen TV inside the tent. Some journalism. We take these things so seriously, but the Democratic convention, like most political conventions, was a staged affair with outcomes preordained. it was all for show. It reminded me of those shots of the New York Stock Exchange with men with clipboards and pinned numbers on their lapels grimacing when the stock market fluctuates. Most stock trades are made on computers feeding the transactions to large servers–exchanges–in nondescript buildings in North Jersey. The New York exchange is mostly for show. Nevertheless, this Democratic convention had a lot to show: Many speeches inspired me and gave me a sense of renewal. And they did it in my town. Fugetaboudit.